I have recently purchased a brand new GMC-500+ (firmware 1.17) and I have several diverse questions that might be very easy for somebody here to answer. I have been reading some posts in this forum, but I am not sure if some of the information I found is up to date / applicable to my device. -The device�s memory is 1 MB. How long does it take before it starts overwriting the oldest data when storing the information every second, every minute, etc.? That information should be in the specs. -Is it possible to configure the time for the power saving option? It seems possible to configure the active time of the display backlight, but not the power saving option. *Are my assumptions right and the calibration points 1 and 2 are for the first tube and the 3rd is for the 2nd tube? *How accurate is the GMC-500+ with the factory calibration at different levels of radiation? I suppose that being the 2nd calibration point 10000 CPM,65 uSv/h does not limit the device to 65 uSv/h and only means that the same slope is used at any measured CPM. *I read somewhere that the combination of readings between the two tubes is done inside the firmware. I understand that the CPM of each tube is obtained in raw, and then the firmware blends both tube sensitivities to calculate a sensible uSv/h dose rate. Has this merging been tested by GC in any know radiation? Where does the second tube become dominant in the CPM reading vs. the first one (which should saturate at some point)? At some point in the future I might have access to some areas with radiation levels up to 45 uSv/h (mainly gamma radiation, measured by professional devices), so I might be able to carry the GMC-500+ with me to compare, but I wouldn�t know how to calibrate the 3 points. If the CPM reading I get in the 45 uSv/h area is 5000, what calibration point should I change? The 3rd or the 2nd one? I suppose that depends on the tube taking the measurements, so I would need the CPM of each tube independently, but that is not possible if the device is not connected to a computer and registering using the GETCPMH/GETCPML terminal commands. Am I right? Could you log the independent CPM for each tube in the internal memory of the GMC-500+? -What it is the purpose of the menu option �Status display� in the �Display options� menu? The possible options are OFF, ON and ON Inverted, but I couldn�t see any change after changing them. -Is it possible in Europe to buy calibrated sources of radiation which are not very expensive? If so, what would you recommend to start with? I can answer some of the questions. Power saving: there's no option to change the time for the power saving, it is set to 30 seconds. Status display: In the large font mode, on the bottom left it says normal/medium/high, it changes the font color/background of that display. Someone might correct me if I'm wrong with these estimates. Can't answer the other questions correctly. Thanks a lot for your answers, EmfDev. I finally found the purpose of the Status display option! About the recording time, I am not sure about the "1 byte per second" thing. 1 byte is only 8 bits, i.e. you could store only up to 255 CPS, or 15300 CPM. In the specs it seems that the GMC-500+ can read up to 982980 CPM, i.e. 16383 CPS, that means that they should be storing at leats 14 bits for each second (2^14=16384) and probably something else with the rest 2 bits to complete 2 bytes or 16 bits per second. That means that your calculated times will be halved. However, all this is only speculation, I haven't checked the binary file exported by the software. Hopefully somebody else will be able to comment of my other questions. The "calibration" things are quite misleading, see manual. CPM, CPS and �Sv/h are all the same thing, i.e. a dose rate. Therefore a single value converts from one unit to the other. In particular these 3 points have nothing to do with a correction of the count rate for high count rates! All calibration are valid for only one specific situation (see manual). To my knowledge it was never published by GQ how they arrived at the calibration value of 0.0065�Sv/h/CPM for the M4011 tube. If valid at all, then only for gammas, not for betas, and only for certain gamma energies. Physics does not allow any generic statement about accuracy; it depends on how close your measurement situation is to you calibration situation! Unfortunately GQ has explicitly said that they keep secret how the switchover from one tube to the other works. I suppose the cal point2 of 10000 is the upper point for the 1st M4011 tube, and cal point3 is for the 2nd tube. The 1st point is irrelevant, but must be set to match the 2nd! If all you care about is some good count rate, get some of these gas mantles ("Gl�hstrumpf") from ebay https://www.ebay.de/itm/Alter-Gluhstrumpf-fur-Test-Geigerzahler-smart-lab-gamma-scout-Prufstrahler/323290586400?hash=item4b459edd20:g:FxUAAOSwWf9ayk-L Though I don't know what the legal situation is in the UK for purchasing/importing them. (These are fibers soaked with a Thorium salt. Hence, also emitting alphas besides gamma and beta; keep them well sealed! If you want to help to clear up the 2-tube mess, you can do so. The only software currently available to log data from both tubes is "geigerlog_simple_500plus". Download from the GeigerLog site. It logs CPM, CPS, CPM1st tube, CPM2nd tube all separately. Remember that the 2nd tube is 30 times less sensitive than the first, so some good source is needed. Many thanks for your answers, ullix. That was really helpful! And you programmed a great piece of software! About radiation sources, I'll try with your recommendations. I can't believe that when I was a kid I played with gas mantles in my grandma's house! I hope they were not the ones impregnated with Thorium! I do not think importing them would be a problem while we are still in the EU (as there are no border checks). I could even have access to deadly radiation sources where I work, but I do not want to/cannot play with that just for fun, and it is anyway not directly related to my job. I�ll see what I can do when the right time comes! The main problem is that, even if I could put the GMC-500+ in a high radiation area, I could not connect it to a PC to be able to use your software and log the readings of both tubes separately. I think that GQ should write those independent values when logging to the device�s internal memory (at least give that option to the user, as I suppose more memory would be required). To finish, I would like to report a minor bug in the firmware: The status of the "Swivel display" option is not persistent after powering off the device. It always returns to "Normal". The tubes are in fact basically linear, and a single number suffices for the conversion. You may be thinking of a saturation effect, which makes you loose some counts. But you can calculate how many counts you have missed, and add those to your observed number, and then apply the single calibration value to the sum of the two! The essential parameter for such calculation is the pulse length. For the M4011 this is about 200�s. Thus, if the pulses came equidistantly, you could handle CPS=5000 (CPM=300000). But since they are coming Poisson distributed, some overlap and are missed in the detection. I calculated (not published) that at CPS=1000 (CPM=60000) you get a 25% error of missed counts. At CPM=5000 your error i 1.7%; negligible with respect to all uncertainties. The count rate is largely dependent on tube volume, and then on tube inner surface (though I suspect the latter effect is mainly relevant only for betas). The conversion factor for M4011 is given as 0.0065�Sv/h/CPM (for whatever condition this may apply). The factor for the 2nd tube SI3BG was given as 0.194�Sv/h/CPM, 30 times less sensitive than the M4011. Assuming that CPM=10000 on the M4011 is the transition point,the 2nd tube would show CPM=335. This is a high enough count rate, that it does not fluctuate too wildly. The dose rate at this point is for both tubes 65 �Sv/h. In principle this is ok.
What actually is your readout for the 3 cal points on your device? (can do in GeigerLog or DV) Because on an earlier version of the GMC-500+ for the supposedly same tube the 3rd point readout was 25=>9.75 which is a significantly different 0.39 �Sv/h/CPM. When your hot office truly has 45�Sv/h of Gamma, then the readout should be 45/0.0065=> CPM=~7000, yet you say you get only 5000. One of the numbers is not right!? You could install GeigerLog/simple_500plus on a laptop to take into the office. Not possible? Thanks for the explanation about the missed events or saturation. I suppose that the reason to use two tubes with different sensitivities is exactly that one, but if the missed events can be accurately estimated, then using two tubes seems pointless! The third calibration point is 25 CPM = 4.85 uSv/h. I also read that value of 9.75 in the forum, maybe that was changed with a firmware update. When I mentioned the 5000 CPM in my first post, I was only guessing a number to prove my point about what calibration point would be needed to be changed when there are two tubes taking the measurement and I don't know the CPM values measured by both of them. Sorry if that was misleading, that number is not a real measurement (I haven't been able to do that yet). Now that you show the calculations, it makes a lot of sense that the GMC-500+ could be using the first tube up to 10000 CPM and the second tube from there on. However, GQ said that the merging of both tube signals to get a resulting dose rate is complicated, so if that is true, the answer may not be that simple. The thing about the laptop looks difficult depending on the area. It is a bulky thing that might not be allowed to stay there when the machine is working. No idea. And a feature request for the next firmware: while navigating in any menu it should be possible to directly jump from the top option to the bottom option (and vice versa) using the corresponding arrow key, without the need to go through all the menu options to find the last one. That would greatly improve the speed to reach the desired menu option. Waiting for ZLM's response, just tested a 500+ and it does have that bug where the swivel display goes back to "Normal" after power down. And for your suggestion, just implemented it in a test code. But don't know when they'll release a new firmware update. Yes that's correct. The two tubes always contribute to the total CPM at any range. For the calibration, I need more information too. No it's not possible to log each CPM individually. Thanks a lot for your answers, EmfDev. I think that the calibration of this dual tube counter should be explained by GQ. If you cannot get the CPM from each individual tube, how would the calibration process be at different radiation levels? In other devices, you take your calibrated source of uSv/h and note the CPM measurement of the device. However, for this device, your measured CPM is a combination of both tubes, so it does not make sense to put that as a calibration point. You can get the CPM of individual tubes, but can not record to the device. When calibrating, I believe they used individual tubes, and based on the CPM of each tube, they generated a curve to match the uSv/h from the given CPMs of both tubes. Remember even in low range reading, the low sensitivity tube still counts but less, but to match the correct uSv/h, then the high sensitivity tube's convertion must adjust. The calculation is a little more complicated, which I don't fully understand either. Is that a bug of the Data Viewer software? 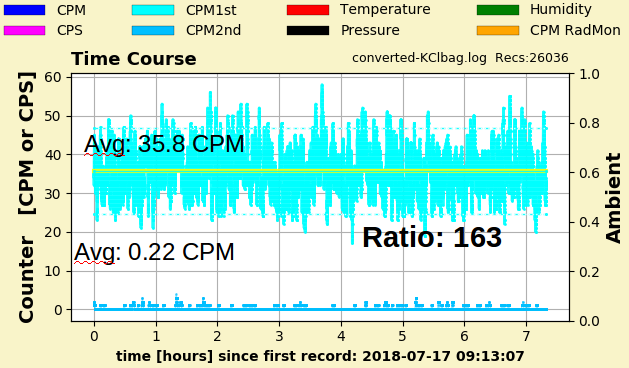 On the other hand, the CPM value is always calculated even when the setting is to record "Every Second". 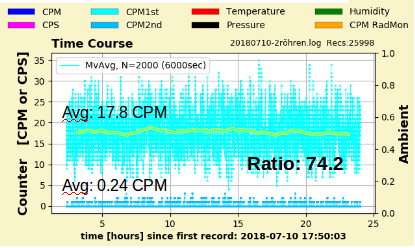 That makes the "Every Second" feature much more useful, even if you only want to get CPM values (for better statistics as ullix wrote in GeigerLog or any other reason). The calculation is a little more complicated, which I don't fully understand either. EmfDev: thanks for the honesty. Is there actually someone at GQ, who does understand it fully, and could report on how this works? What I can see from my work is that it is pretty much a load of nonsense. I'll explain, using data generated by tester the_Mike, who kindly provided this to me and allowed public usage. 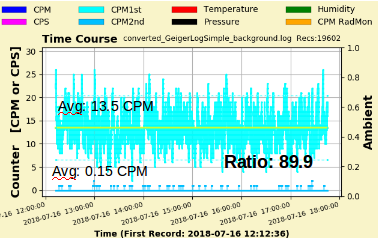 The data were recorded using 'geigerlog_simple_500plus' ( https://sourceforge.net/projects/geigerlog/ ), which is able to record CPM, CPS, and the CPM from 1st and 2nd tube individually (and so far the only program which can do that). From the well over 3000 records I show a short sample; the rest is in perfect agreement with that. As you see, CPM is the exact sum of the 1st and 2nd tube! And CPS is also based on the combination counts of BOTH tubes, not on any one individually (and it had been stated that the counter firmware does not allow the separate CPS reports of the tubes). The counter applies a calibration factor of 0.0065 �Sv/h/CPM to convert from CPM to �Sv/h. But note where this is applied to: to CPM, i.e to the sum of the counts from both tubes! This effectively says that your radioactive source has just become twice as strong simply by including a 2nd tube to measure it! This is complete and utter nonsense; and this is polite wording! In this case the two tubes were almost similar. Obviously, when the two tubes are very significantly different in sensitivity -- as your commercial sales products are -- the nonsense is only increased. Please, explain how this is supposed to work. The data presented show it is not working. To the users with a GMC-500+: Could you please try to run a similar experiment and report the numbers? Checked with others. The hardware has been designed to support low sensitivity tube only for the low sensitivity tube location. the conversion will also be incorrect. Wow! That is a great experiment, ullix. Thanks a lot for that info. -	Put it into a good radiation source at different levels (and preferably together with a professional radiation detector), and count the CPS, CPM, etc. of both tubes and note the dose rate in uSv/h. This is complicated, even risky, and requires to connect the device to a laptop to be close to the radiation source. -	Somebody that understands more about electronics than I could connect a signal generator to the GMC-500+ and artificially generate two trains of pulses with a different repetition ratio of about 30 times (the ratio of sensitivities between tubes), and check the results for different levels of pulses per second. With that setup, we should be able to decode the firmware algorithm to combine the different CPS or CPM between the tubes. @EmfDev: I'm sorry, but this is a pretty lame excuse for not dealing with the real problem, which is, for one thing, a wrong concept in handling the counts for both tubes. Let alone the other thing that this counter had failed completely when user jjm386 applied it to a real world situation with truly high count, see http://www.gqelectronicsllc.com/forum/topic.asp?TOPIC_ID=5148 Reply#13. The conversion is not only incorrect, it is nonsense, whatever the tubes are. You are taking the sum of counts from both tubes, while you should be using the average of the sensitivity weighted counts of the two tubes. So this 500+ device can handle up to 42500�Sv/h? With the "calibration" of 0.194 �Sv/h/CPM as stated by ZLM (though a value of 0.39 had previously been implemented in the firmware) the CPM reading at max will be 42500/0.194 = CPM 219 000. Since CPM is reported in a 16 bit number and the max for 16 bit is 65 535, I surely wonder how that will work. And now you say despite the counter is supposedly able to handle >200000 cpm, it is confused by ~200cpm? Can you provide any information demonstrating that this device ever worked as advertised? I am sure some tests were done before this was put up for sale? - Put it into a good radiation source at different levels (and preferably together with a professional radiation detector), and count the CPS, CPM, etc. of both tubes and note the dose rate in uSv/h. This is complicated, even risky, and requires to connect the device to a laptop to be close to the radiation source. - Somebody that understands more about electronics than I could connect a signal generator to the GMC-500+ and artificially generate two trains of pulses with a different repetition ratio of about 30 times (the ratio of sensitivities between tubes), and check the results for different levels of pulses per second. With that setup, we should be able to decode the firmware algorithm to combine the different CPS or CPM between the tubes. @ikerrg: I agree on both points. Re the second: not very difficult once you have the appropriate equipment. I did it with a single pulse train on a single tube counter here: http://www.gqelectronicsllc.com/forum/topic.asp?TOPIC_ID=4613. It demonstrated that the 300E+ counter collapsed somewhere between 2000 and 5000 CPS. I cannot run two pulse trains simultaneously, though. The firmware algorithm is hard coded and always assume the second tube is the low sensitivity tube. The firmware has no idea you actually changed the tube to a high sensitivity tube. So the final conversion will based on the two tubes: one Hi-sensitivity and one Low sensitivity. Not two high sensitivity tubes. The low sensitivity tube should follow the low sensitivity tube characteristics. Such as it always has lower enough count than higher sensitivity tube at the same level of radiation. I cannot promise anything yet! When the opportunity comes, I will easily be able to put the GMC-500+ in an area of about 30 to 50 uSv/h (and maybe even compare to a professional detector), but I do not expect to be able to use a laptop to log both tubes independently. I am not sure if the 30 to 50 uSv/h dose rate is enough to see the effect of the second tube in the calculation. Let�s say that I can put the device in an area where the dose rate is 65 uSv/h. That would create 10000 CPM in the first tube and 335 CPM in the second tube. If the device is just adding both CPMs, it will be measuring 10335 CPM, which is approximately the same as 10000 and using the high sensitivity tube conversion rate the dose rate displayed would be 67uSv/h, too close to the real value that no conclusion can be taken. So, unless the high sensitivity tube starts to miss events in a 65 uSv/h dose rate, I don�t think we could ever see the effect of the second tube in the result. Even at 650 uSv/h, the ratio between both tube CPMs would be the same (close to 30) if there is no �saturation� effect, and that can only be seen by measuring the CPM of both tubes independently. and 5.563333 (334-335CPM) to the low sensitivity tube terminal and got a total CPM of 10334-10336 from the unit and it gave a uSv/h of ~67.18. So your assumption is correct if the geiger tubes actually produce those exact counts from a calibrated source of 65 uSv/h. Aaah, finally some hard numbers, thank you. So, we simulate a 65�Sv/h environment with a signal generator. Let's remember that this GMC-500+ is a device, which, according to the specs, is able to handle 42500�Sv/h (from user guide: https://www.gqelectronicsllc.com/GMC-500UserGuide.pdf ), i.e. we simulate at the 0.15% level, the upper end is 650 times higher. Perfect; both tubes, although having a 30fold difference in sensitivity, are telling the correct strength of the source. Now we look at the counter and see it telling us that the strength of the source is 67.18�Sv/h. Oooops, how can that be? We had calculated our numbers based on a source defined to be 65�Sv/h? The cause is that the count numbers of the two tubes were added, and then the calibration for the high sensitivity tube was applied. Why not apply the calibration of the low sensitivity tube, then the source would become a whopping 2005�Sv/h? Because it is big time nonsense to ADD the counts; you can't go any more wrong than doing this. The weights are the relative sensitivities of the tubes, i.e. 1 and 30. (10000 * 1 + 335 * 30) / 2 * 0.0065 = 65�Sv/h. As it should be. Now let's look at the high end of 42500�Sv/h: The low sensitivity tube would deliver 42500/0.194 = 219000 CPM. How do you present this as CPM in a 16 bit number, which has an upper limit of 65000? Let alone that the high sensitivity tube would be at CPM=6.5million, and be completely overwhelmed by the count rate long before reaching this level. So, at one point you'd have to switch the 1st tube off completely, while up to this point you are adding both count values? I suppose that they should produce those CPM counts because the calibration sensitivity is coded in the GMC-500+ firmware for each tube. So this result looks conclusive! Thanks for doing that, EmfDev! Then I have to agree with ullix. The algorithm seems to be adding both count rates, and that is clearly wrong! Just a simple weighted average would be better (as ullix proposed), although it wouldn�t work for high radiation environments where the first tube would be completely overwhelmed. That is why a better algorithm to combine both lectures is required in the firmware, and a better understanding about when the high sensitivity tube becomes less sensitive due to the high CPM rate. About the 16 bit number, I recall that somebody told me that the GMC-500+ uses a 32 bit processor, and maybe it can count up to 32 bit numbers� no idea. I�ll check when I can do that, as I have to leave the PC on for a day. Maybe next week. By the way, another question about the GMC-500+. If I select the non-rechargeable battery option in the menu, I suppose that the firmware will disable the charging of the battery. Is it safe to have it connected to a PC through the USB port in that situation? I don�t see why not, but the last time I tried that, it looked like the battery charged a few percent, and that could have been dangerous if the battery inside actually had been non-rechargeable. chemical reaction for the battery trying to recover from not being used. @ikerrg Yes it safe, if you use a non rechargeable battery then it won't charge. The spike might just seem to be a chemical reaction for the battery trying to recover from not being used. Please, check that again in firmware 1.17 of GMC-500+. I have just connected my device with a 76% of battery (and the setting set to non-rechargeable), and now, after 2 hours, it is at 99%. I have disconnected from the USB, power off and on again, and it still shows the battery totally charged. So indeed the USB port charged the battery when the setting is not to recharge it! That is really dangerous and requires urgent action! @ullix Your way will be discussed if we will reimplement the calculation using your way. But the original calculation is still within the 15% tolerance. EmfDev, that is not the problem. Even if the calculation is in 15% of tolerance for that dose rate, the way it is calculated is inherently wrong, and it makes pointless the use of a second tube, which is the whole point of the GMC-500+. All that is true unless you know that the first tube stops increasing the CPM above some dose rate, in which case there would be an overlapping region which needs to be evaluated differently (and then use the sensitivity of the second tube). By the way, have you tried using the commands GETCPSL and GETCPSH for CPS? They do not return an error, but the 2 bytes returned do not make much sense to me. Downloading Attachment failed with Error. @EmfDev: Is there something wrong with this one, or not possible at all? According to EmfDev http://www.gqelectronicsllc.com/forum/topic.asp?TOPIC_ID=5148, see Replys #1...#3, there is no CPS command for the individual tubes. and you see that these CPS commands just return the same answer as the standsrd CPS command. By the way, this is the same for the CPM_L & H commands, those just return the standard CPM answer. My explanation for why these commands work without error on my 300E+ and probably any other counter is the functioning of the command parser in the counter firmware: after it has gotten to '<GETCPS' or '<GETCPM', resp., it doesn't care about the rest, being '>>' or 'L>>' or 'H>>'. The reason for your strange CPS answers is that you need to 'binary AND' the data with 0x3f, i.e. cut off the upper 2 bits, only 14 bits are valid for a max of 2^14=16384, e.g. I see you saying at the next traffic stop: "Officer, that was well within the 15% margin we are used to at GQ"
Now that we have cleared up this issue, how does the changeover between the tubes work? Or was thought to be working, because according to jjm386's experience http://www.gqelectronicsllc.com/forum/topic.asp?TOPIC_ID=5148 Reply 13, it failed miserably? Given the setting of calibration point #3 at 10000CPM, this is likely the transition point. Yes, maybe EmfDev should try the same experiment at a little higher frequency (to achieve 15000 CPM in the first tube and 500 in the second) and see if the firmware has that transition that you expect. Thanks for the clarification about the GETCPSL and GETCPSH commands. It comes from the M4011 tube manufacturer. Ullix, maybe that can give you some clues about the upper CPM limits of the tube. Regarding the battery, I changed the setting of a 500+ to non-rechargeable and charged a 3.59V battery and still 3.59V after more than 12 hours. Also tested a 2.75V battery for few hours and become 2.73V. Used a multimeter to measure the voltage. I do not understand. I haven't done anything weird here. Just changing the mode to non-rechargeable and plug it in a USB port of my PC. It definitely charged the battery yesterday. It is difficult to test this several times as now I would need to discharge the battery with an external resistor, as the GMC-500+ is not so power hungry (good design by the way). Did you try to read the battery with the USB plugged? When you plug the USB the battery reading will be different. No, the battery was at 76% before connecting the USB, and then after disconnecting and power off and on again, it was at 99%. I'll check again when the battery reduces its charge level, but I have no way to probe it. As a possible explanation not yet confirmed, I remember that I changed the option to non-rechargeable and switch the device off and on again before connecting to the USB, so maybe the option is not persistent in function (although it is persistent in the screen). you click the battery type one time it should popop non rechargeable. Yes, I was careful enough to check that the setting was in the non-rechargeable status. I am now discharging the battery so I can test again tomorrow. Today I tried again after reducing the battery charge to 83% (3.92 V). I had set the Battery Type to Non-rechargeable, and made sure that it stayed there. I switched off and on the GMC-500+ and then I checked again that the setting was still Non-rechargeable. I connected it to the USB port in my PC, and immediately, the battery icon went to full and the battery seemed to be charging. I monitored the voltage for a few seconds and it was increasing (like the other day), so I decided to go again to the Battery Type option to see if it had changed. It hadn�t, but just when I selected the Battery Type menu (not changed the option at all), the battery icon went to less than full, and the voltage stopped rising and came back to about 3.92 V. I do not know what it is happening, but I am sure that the other day the setting was in Non-rechargeable while the battery was charged, and it would have been the same today if I hadn�t opened the menu option while the USB port was connected. I�ll do more tests when I have more time. Now it is not charging, so the Non-rechargeable option seems to be accepted by the firmware, and I suppose that the next time that I connect the device it should not charge the battery. I found the keys at my 300E counter always awkward to handle, like when trying to enter a date. You kind of never knew what you entered. I then did this only from within GeigerLog. At least for this entry it worked reliably. Unfortunately I did not find the battery tape relevant enough, so did not do an explicit setting, and not even a readout. Nevertheless, you can still get the readout from GeigerLog, and this may be more reliable than pushing the keys at the counter. Just do a Device -> Show Device Configuration Memory (or do CTRL-G), and you get a listing like in the picture. 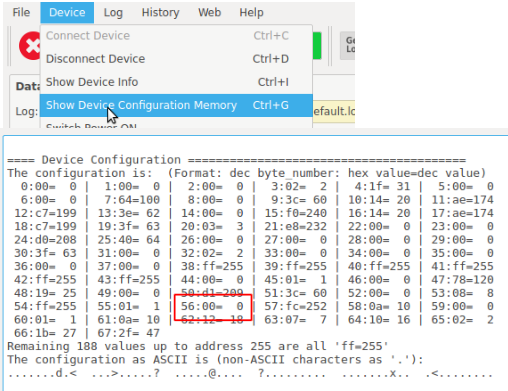 At byte position 56 you find the battery info. Hopefully EmfDev can tell what the readout options are; zero, as shown for my device, should be rechargeable. Data collection is a bit on the short side, but there is at least some result. In the top picture the cyan curve is the 1st tube, and the light-blue crumble near the zero line is the 2nd tube, both in units of CPM. The 2nd tube has a max of 2CPM, and an average of 0.26CPM. Compare the cyan curve with the one in Potty Training under Exper.Results B (page 7) - it is almost the same to the decimal. It's giving good confidence on the reproducibility of such setups! The plastic case of the counter is holding back most of the betas, leaving through the gammas. While count reduction is generally bad for experiments, here it is welcome. The reason is that while we have a good sense of the behavior of the M4011 tube, not much is known on the 2nd tube, the SI3BG. In particular, we don't know its beta response, and any calibration factor is applicable to gamma only! So now with an almost only gamma source, the two curves should overlay, if they were plotted in terms of �Sv/h instead of CPM. This is shown in the bottom part. The yellowish line is the Moving Average for the 2nd tube. This line and the cyan line should overlay. It is not even close! And not only that, the 2nd tube does not show any response to the the KCl at all! One could get the two curves closer together by doubling the calibration factor, e.g. back to the 0.390�Sv/h/CPM it had been in the firmware before. It still wouldn't correct the non-response to KCl! What we see as 2nd tube counts might be just electronic noise, but even the level specified here https://www.pocketmagic.net/tube-si-3bg-c%D0%B8-3%D0%B1%D0%B3-small-geiger-muller/ of 12CPM isn't even reached with our 0...2CPM! My conclusion: the data are so far off from the claims, this 500+ counter with that tube isn't working at all! Is there even high voltage at the anode of this tube? I completely forgot about getting you more data during this weekend. In a similar experiment, I could even hold the KCl bag further from the M4011 tube and closer to the SI3BG tube (gammas are not shielded, but the inverse square distance law should kick in), but the only way to confirm that the SI3BG is working is by immersing it in a bigger radiation environment while I log both CPMH and CPML. I cannot do that at my work for now, but I could manage to get an uranium glazed plate to do the test. I expect the SI3BG to react clearly to 2000 CPM in the M4011. If it doesn't, then we would have been cheated with this counter! I suppose that in your experiment the KCl is not enough for the sensitivity of this tube, and you are only getting noise. For an averaged count of 40 CPM in the M4011, we should be getting 40/30=1.33 CPM in the SI3BG. I see your point, and we are measuring less than that by almost one order of magnitude. However, the number is so low that I suppose that the statistical error is massive, and we will need much more time measuring to see the effect of the KCl. If GQ updates the firmware of the device as indicated, we would be able to read the CPS on both tubes independently (and hopefully log them into the memory). That would be great to debug all this problems and improve the device. 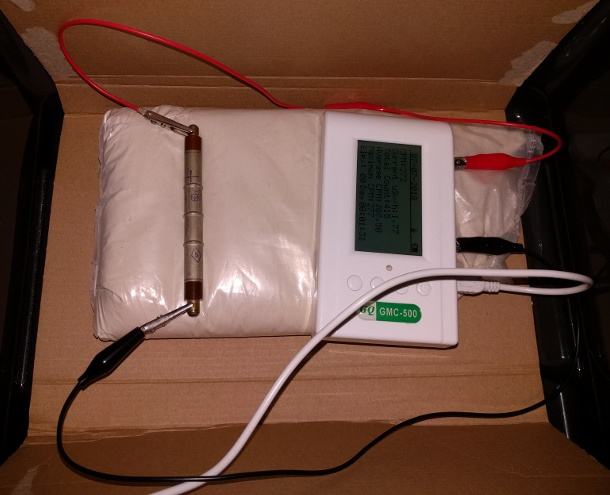 I couldn't imagine that there is no voltage on the tube, as the experiment done by the_Mike showed that connecting a different tube to the same SI3BG terminals works as expected (though the adding of the CPMs of both tubes done by the firmware is just wrong). Can I measure the voltage in the SI3BG terminals with a voltmeter? I think I can have access to the terminals through the plastic grid, without opening the plastic case. Just got this logfile from the_Mike with a 2-tube collection. Background only, with a much longer collection time. Result basically the same as with ikerrg's data. The ratio between the tubes' CPM is 74.2 fold. This is 2.5fold more than the claimed 30fold difference. GQ: can we'd appreciate if we could see the data that made you define this as 30fold? @ikerrg: a regular voltmeter can be used when it has a range >~250V. The true voltage at the tube of ~400V will collapse down to 140V +/- 20V. See the helpful discussion: http://www.gqelectronicsllc.com/forum/topic.asp?TOPIC_ID=3745 (strangely, my contribution to it was disappeared?) Within that range both anodes should have the same value against ground. For more correct measurements you need a 1 GigaOhm resistor in series with your voltmeter probe, and set your voltmeter to the 5V range. Your 'hot office' would still be the best choice. This is pure gamma? Or would the device also be showered with beta, alpha, proton, neutron, leptons, baryons, or whatever is in the particle zoo? If you don't have any of the Kalium salts at hand, then a regular garden fertilizer will be 2nd choice. But not all qualify, see Potty Training. And measure in CPM mode, NOT CPS, and use GLsimple500 to record both tubes. And for a looooong time! Oooops, this "range >~250V" meant "about 250v DC or greater". The '~' character was not meant to signal alternating current !!!! 1 is non rechargeable. 0 is chargeable. battery voltage. it is reading. What do you mean about measuring in CPM mode? 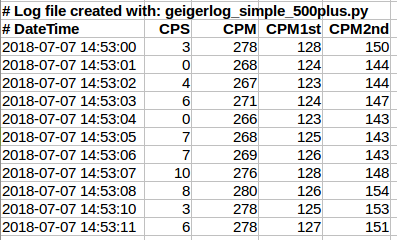 GeigerlogSimple500 is logging every second the CPS and CPMs. I cannot control that as far as I know. Yes, I have Potassium Chloride KCl as you saw in the data I sent the other day. However, I only have 100 grams, so I cannot cover the counter on both top and bottom sides. Again, I might have access to uranium oxide glazed crockery at some point, and I suppose that information would be much more interesting and it should clearly trigger the low sensitivity tube. About my �hot office� as you call it, the easiest place to put the device in is filled mainly with gamma, but it could stay there for a short period (maybe 1 hour?). I might be able to expose it to neutrons, but that will activate the high Z elements of the detector (mainly copper and steel), and I do not want an active detector! In any case, the main problem is that I always need a connected laptop to log the independent readings of both tubes (using GLSimple500), and that we cannot read events per second in each tube independently yet. So that is not an option for the moment. I�ll keep checking the battery when I have discharged it a little bit more and I have more time. Good Lord, leave the neutrons away; I tried to make a joke! Gamma is what we want. You posted the CPS/CPM question elsewhere too, see my answer there. Of course, if CPS is important to you (why?) 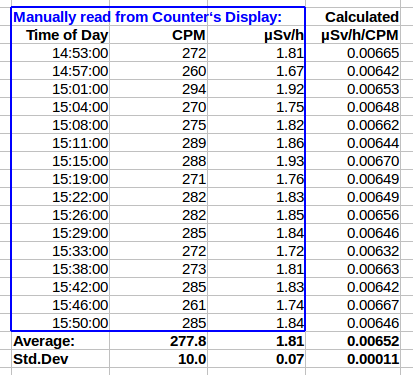 you can derive it from the CPM reading, when done with 1sec cycle. Can be done in Excel, too. (change in last sec minus change 60sec ago). Provided, CPM and CPS remain linked, which they should at these low count rates. An hour would certainly give interesting data, but yes a computer connection is needed. 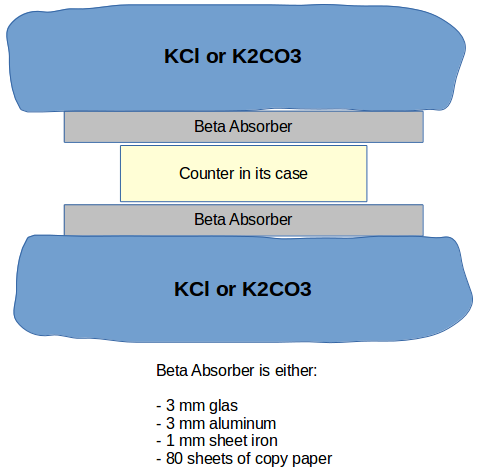 KCl and K2CO3 is available here from Amazon for 10� the kg, even in food quality, including shipment. Uranium has a lot of betas, some even harder than from K40. The beta response of the tubes is likely different from gamma, and tells us nothing about gamma calibration. Give it a try. we may have to determine what shielding is needed to keep the betas out. Your log data show the same thing again: a grossly overestimated 2nd tube with only 30x lower sensitivity; it is 90x lower this time. I think background level data we have enough. To filter the betas of the uranium plate (when and if I manage to get it) I can use a copper busbar (6 mm thick if I remember correctly), that should not affect the gammas. I suppose that it will generate some xrays from the slow down of the betas, but that is also measurable by both tubes, isn't it? So the signal detected by both tubes should be purely made of high energy photons at different energies. By the way, is the KCl edible as the NaCl, or is there any limit to use it in food? I'm not talking about radiactivity, I am talking about its chemical behaviour in the body. If I can use it in the food as NaCl, I might buy a bit more. Using the Range formula in my Potty Training and using the hihest beta energy I can find in the decay chain (=5.5MeV!) I estimated the thickness needed for complete stoppage of betas. so your busbar should be plenty. Some bremsstrahlung will occur, which I also think is welcome, though some gamma, since most of it is low energy, will be absorbed in the thick copper. Should work nevertheless. But I am curious to the overall intensity of the pottery; I have a Uranium glass button, which is rather mediocre. Apparently KCl is needed for creating certain gels, where NaCl is not working at all, Fashionable here as 'Molecular cooking' ;-). I tasted it: would NOT be able to distinguish from NaCl. K2CO3 is also edible. It is used as baking powder typically in Christmas baking. I tasted it: yuck, it has very foul taste! But it smells not at all. It looks like the uranium glazing used in some pottery is much more concentrated than the uranium used to make glass. I don't know how people could be eating in plates glazed with uranium oxide! If you scratch the surface with a knife while chopping a steak, you could be eating uranium oxide, and while the alphas are not dangerous outside the body, they are very dangerous inside! It gets stranger by the minute. The 2nd tube has nominally increased from 0.15 to 0.22 but I'd be hard pressed to say it is statistically significant. Anyway, the ratio between the two has now increased to 163! What happened to the claimed 30fold difference? The SI3BG tube's "counts" are so low, I am not even sure these are real Gegier counts. It could be just electrical noise? I suggest this test: take of the cover off from the counter and place the KCl bag very close to the SI3BG tube. At least the K40 betas should make the tube click and tell us the tube is working at all. Won't tell us anything about the calibration factor, as this is relevant for gammas only. Maybe the counts are lower because I had to centre the device on the bag to be sure that both tubes were equally exposed. The bag is not very big, so it is possible that the "view" of the KCl has been reduced on both ends. In any case, both tubes shoud be immersed in the same radiation. I still don't want to open the case as my device is under warranty. But I am looking for other options. -	Power off and on again. My device is charging the battery. The only way to stop doing it is by going to the battery menu while it is connected to the USB and just opening (no need to change) the battery type option. I cannot probe this in any way. You will need to see a video of the process, but I am not lying. Something is definitely wrong. I believe you. I just don't know why your device is different. for 300 and 320). Because there are no batteries of this type/size that is not rechargeable. So in the later firmware of 500/500+, it will be removed. Well, it does work. It is only that it is not activated unless you open the battery type menu, and then the device does not charge anymore during that USB connection. I wouldn't remove it, as it is usually better for the user to be able to control the charge of the battery in any case. If everytime I connect it to the USB it is going to charge the battery to the 100%, that is worse for the Li-ion battery (it is better to lower it to about 80% before recharging it again). It is like in many laptops today. That's not necessary, it will be removed. Well, it has already been removed in firmware v.1.18.